Welcome to the March End of Month View. The view above is from the shadier end of the Long Shady Border. There are a few gaps, such as where I'm waiting for the perennial Epimediums to come up and the evergreen ones to fill out more and flower, but on the whole it's looking quite lush. In the pot in the bottom right is Hepatica transsilvanica 'Blue Eyes', only just sending up shoots, and Cyclamen pseudibericum which I proudly grew from seed! I'm not sure if I'll get flowers from the Cyclamen this year but the Hepatica should be flowering by the end of April, but possibly early May as the potting up may have delayed it. One of the evergreen Epimediums (above), I think Epimedium x youngianum 'Roseum'. I'll be able to confirm its identity once it flowers. As you move down the border to the Bog Garden, where the square pot is, the growth thins out a bit as there isn't much in the way of evergreens. 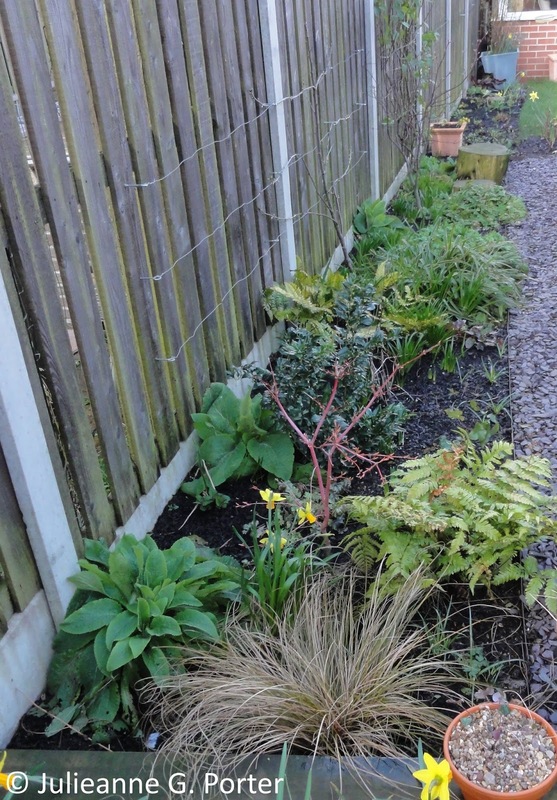 Starting now from the conservatory end of the Shady Border (below), life is really getting growing now, with the Astrantias sending up shoots and Digitalis purpurea 'Pam's Choice' filling out. It's still a bit bare at this stage, but there are some plants of interest. 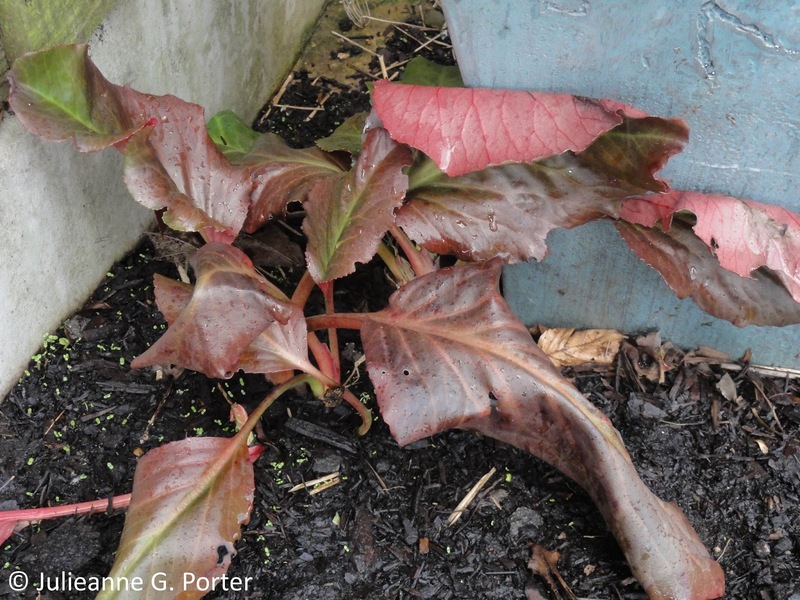 This following plant is meant to be Bergenia 'Wintermarchen' though it seems to stay red all year around, so I'm not sure if I've somehow mislabelled it. It's the only Bergenia I have though. 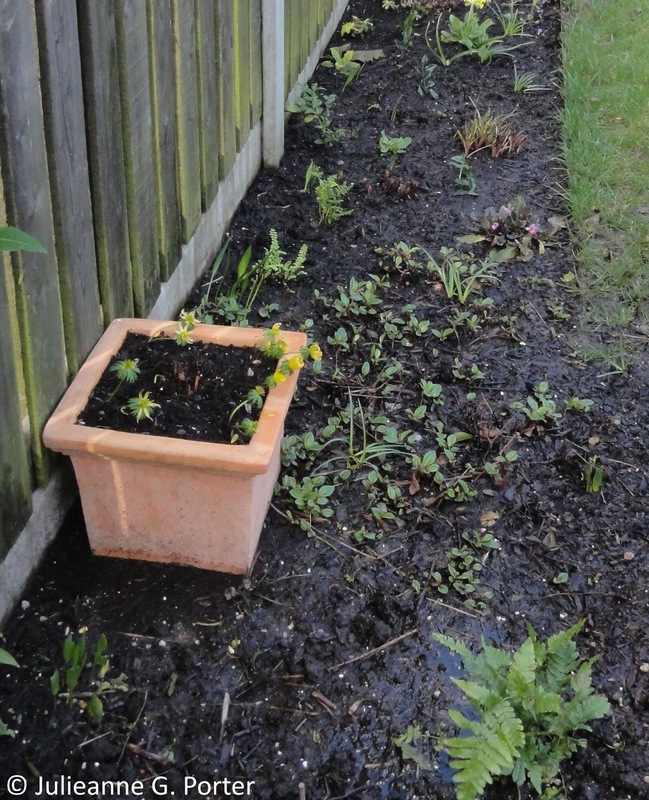 Whatever it is, after taking some time to settle in after planting it in summer 2013, it's finally looking healthy and I'm hoping for flowers from it this year. 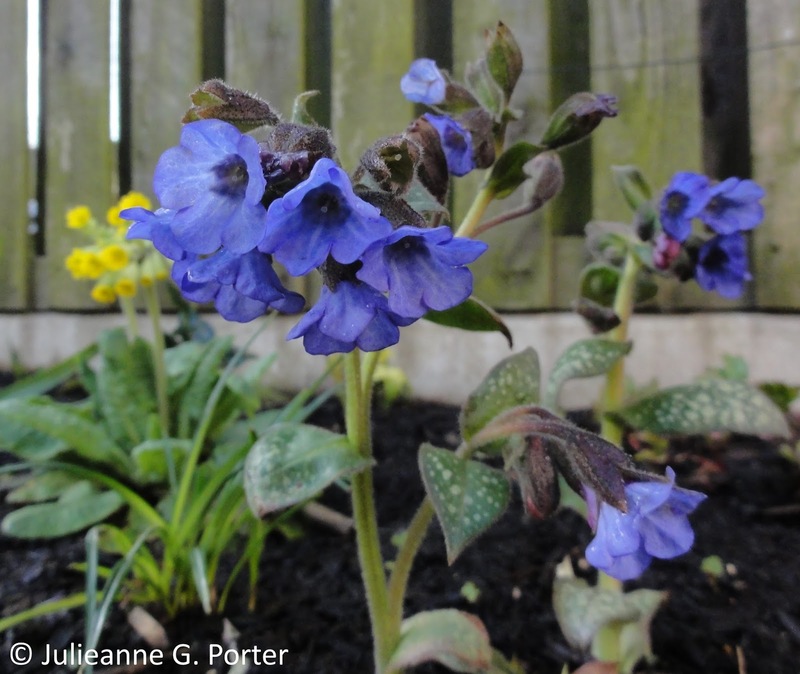 I do rather love Spring blues and here are three that have started flowering. In the Bog Garden, after starting to dry out a little with the ongoing March winds, this reversed with the heavy rain at the end of the month and I think you can see that it really is quite boggy, with some water sitting on the top of the soil. 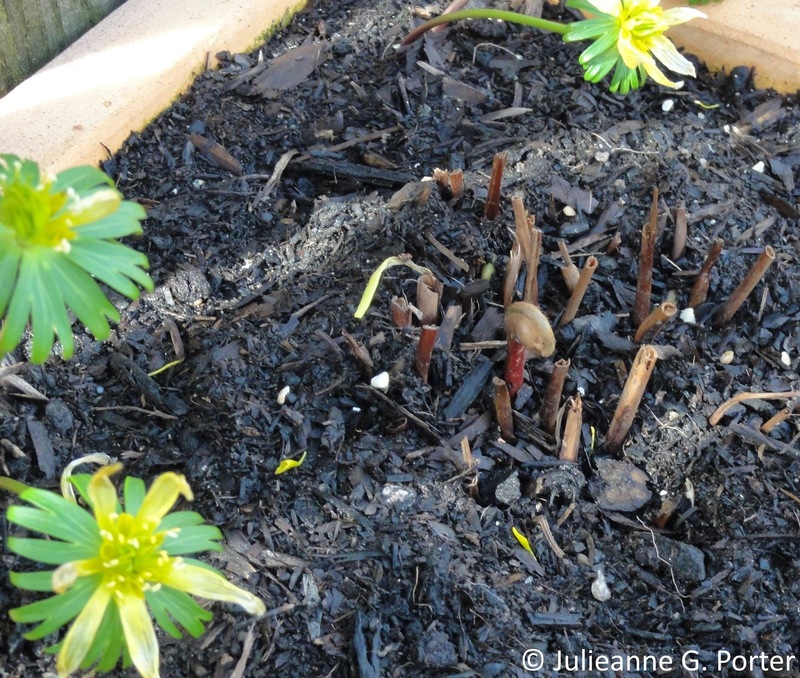 After potting it up in February, I'm pleased to see that Osmunda regalis 'Purpurascens' is starting to send up shoots. 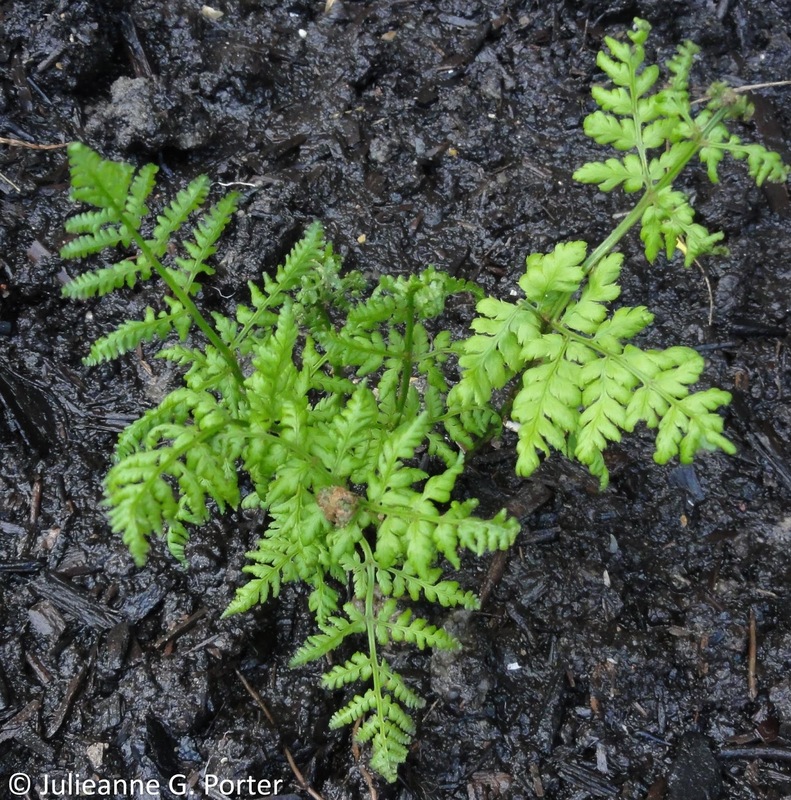 And one that is supposed to really be happy being damp, so I've planted it in the boggiest part of the Bog Garden, Dryopteris erythrosora. 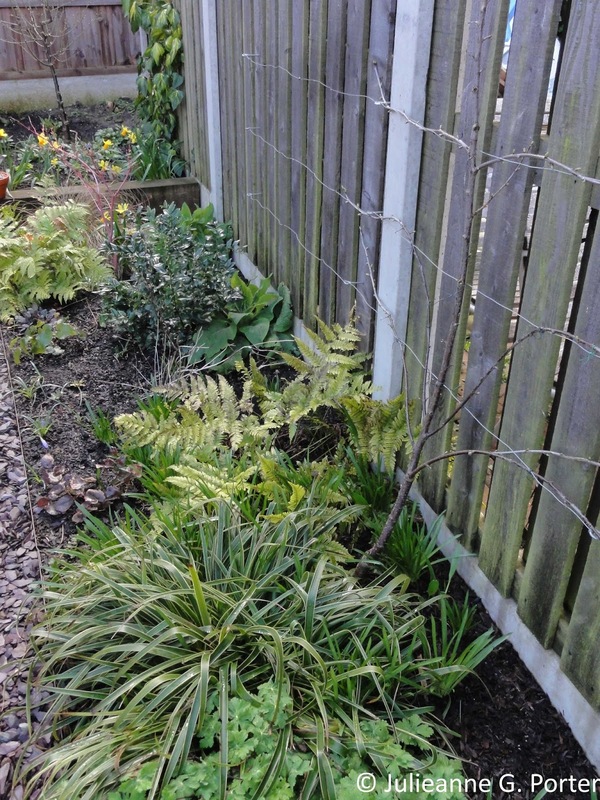 These three evergreens should help add year round interest to the border and hopefully make it look a bit more lush, similar to the shadier end. 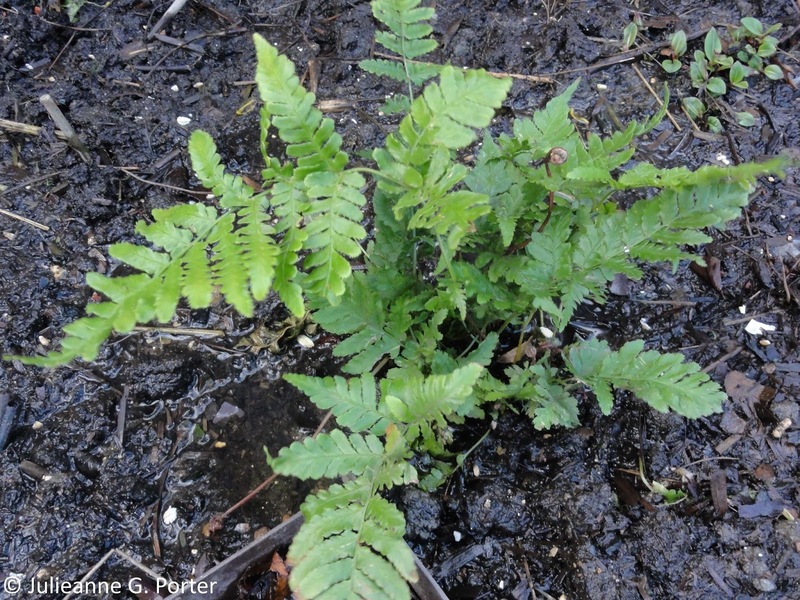 Also from Fibrex Nurseries are perennial ferns Dryopteris wallichiana and Athyrium otophorum, which only have tiny shoots at the moment so not much to see just now, but I'm sure we will see more of them in April. 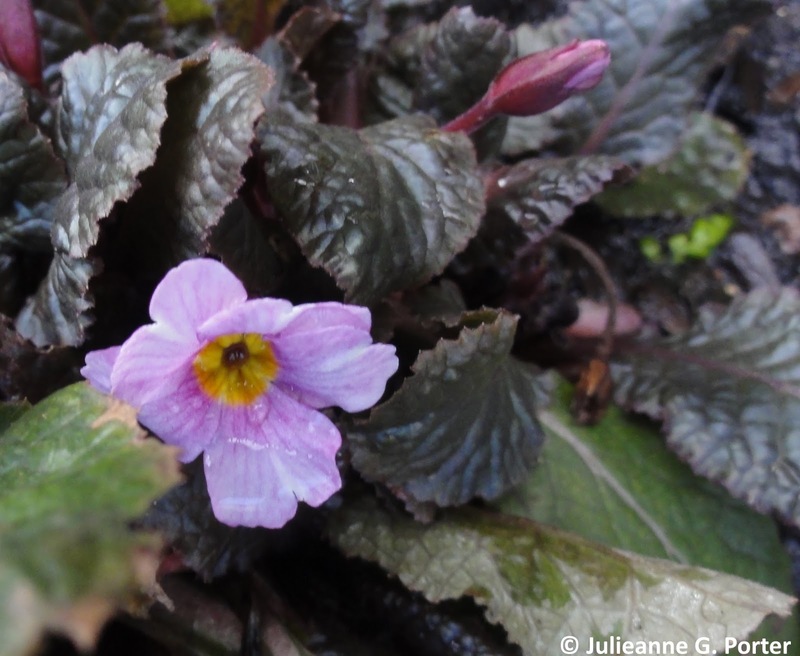 The lone flower in the Bog Garden is one of my favourite primulas, Primula 'Guinevere'. 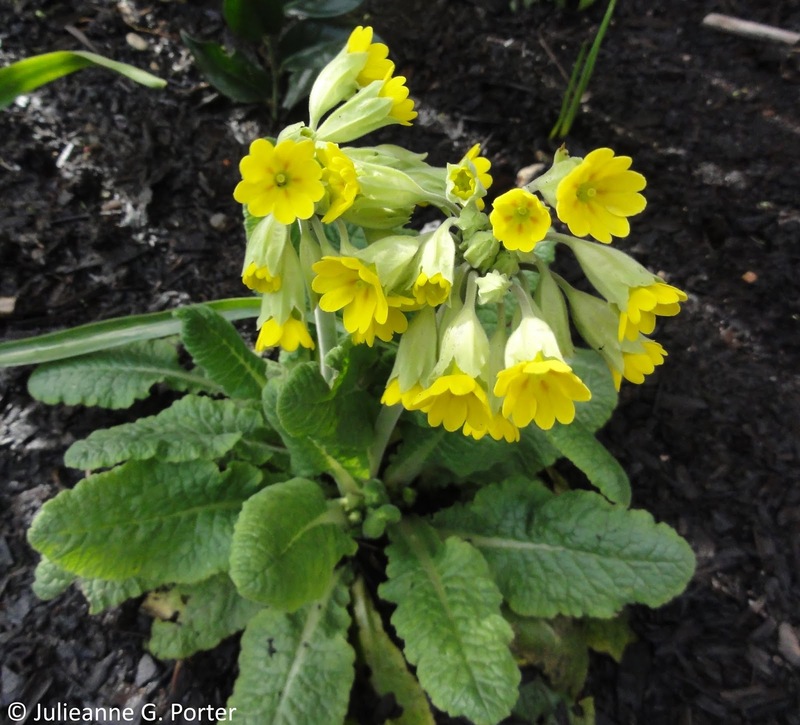 I have almost completed planting up the Bog Garden, and just need to add in April, Primula beesiana and Primula florindae, which I've chosen thanks to suggestions from readers of this blog. 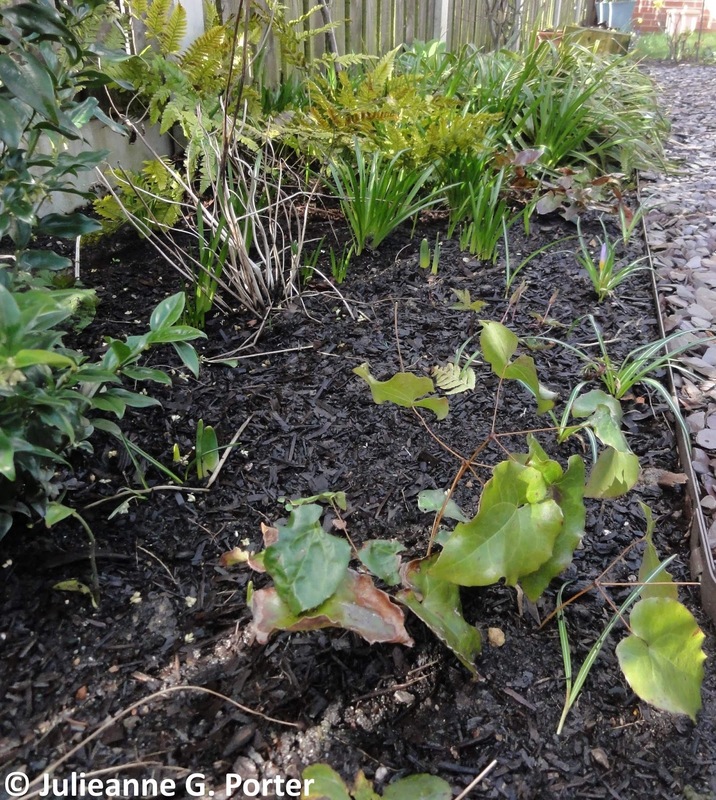 Further along the Shady Border lots of bluebells have emerged and the evergreen woodrush Luzula sylvatica 'Marginata' has started it's attempt to expand further. I think I may need to dig some of this out soon. 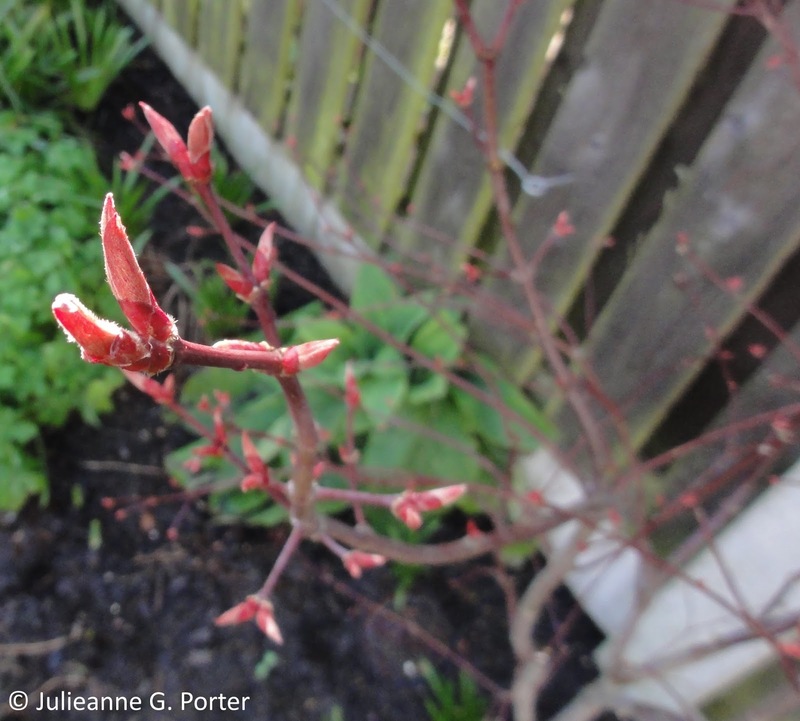 Acer palmatum 'Bloodgood' is also ready to leaf, I'm sure we will see it fully open by the end of April. I love the way the it catches the sun giving it a glowy pinky-red. Slowly the Morello Cherry awakes from it's slumber. Will I get any fruit this year? 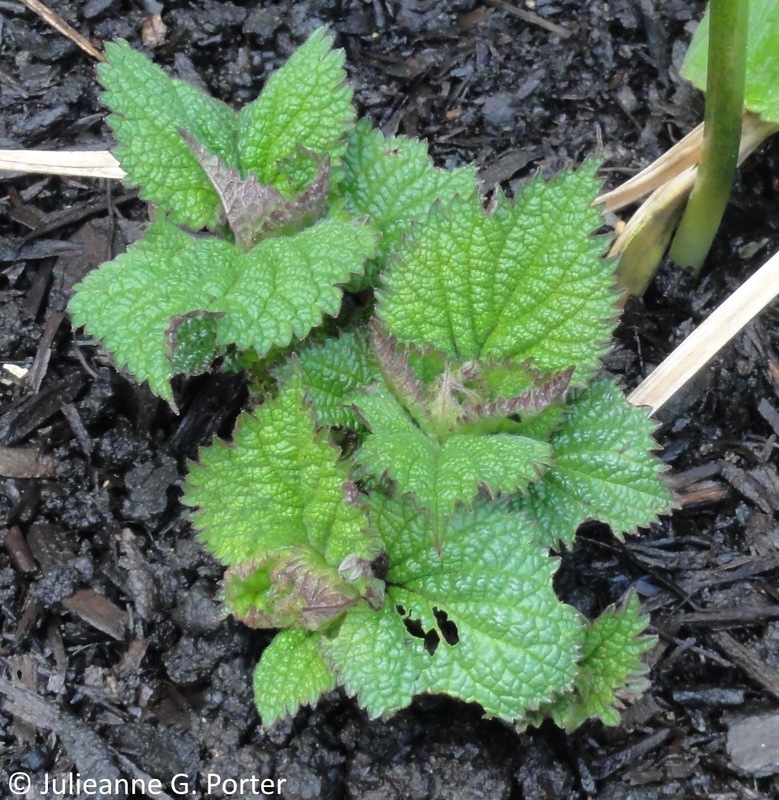 The first shoots of Lamium orvala have appeared. 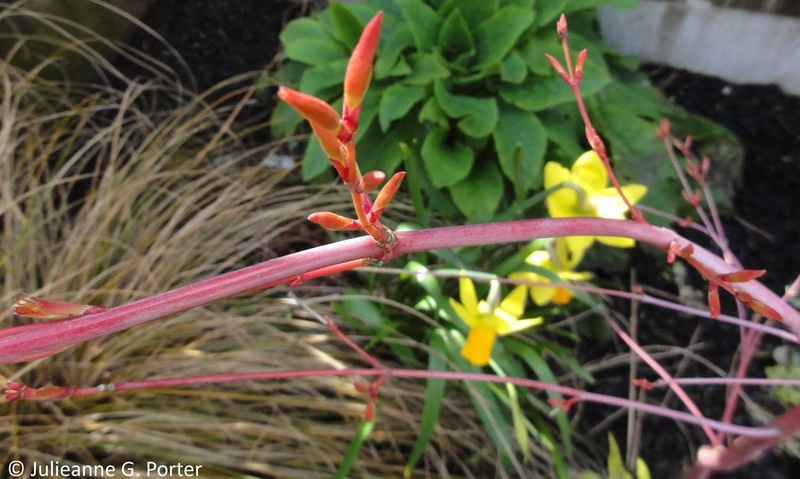 I'm really pleased to see that Acer palmatum 'Sango-kaku' has survived the flooding and subsequent replanting from last year and is now looking quite healthy. 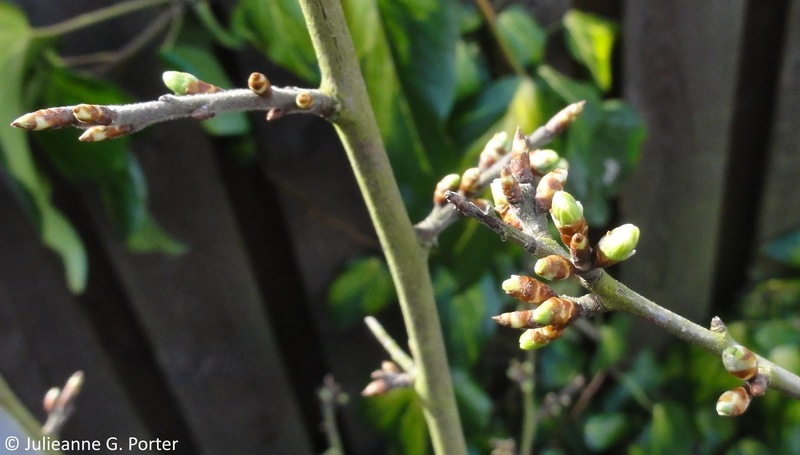 At the very back in the Damson Border there are lots of buds on the Damson. I did get a couple of fruit from it last year, although they fell off before they were ready. So have hopes that this year I might have more, enough to get to eat them. I don't expect there to be enough for making jam just yet, maybe next year. Underneath the Damson the comfrey patch is coming to life, as is this unknown variety of Pulmonaria that I got from my mother-out-law Audrey. 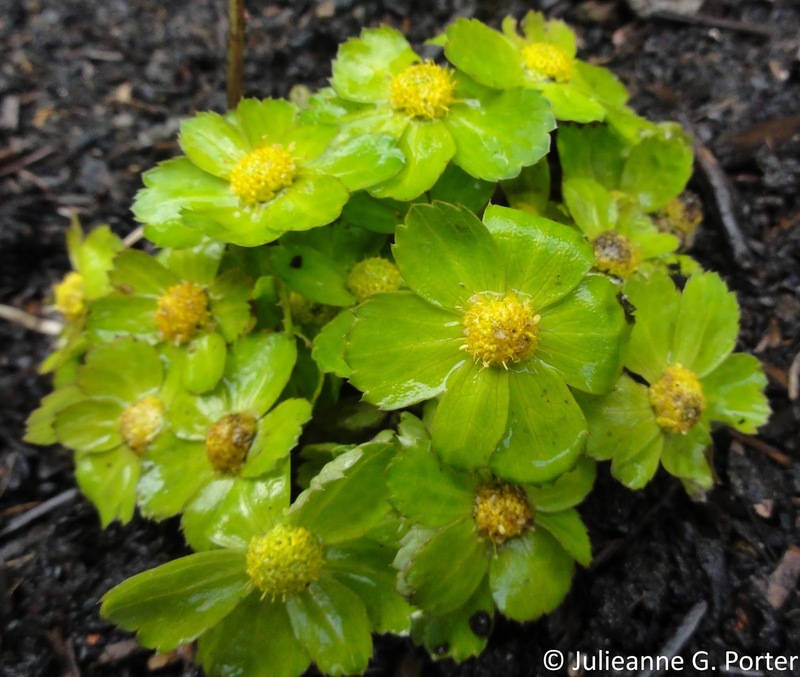 Plus this Hacquetia epipactis which is forming a nice mound of yellow-green flowers. 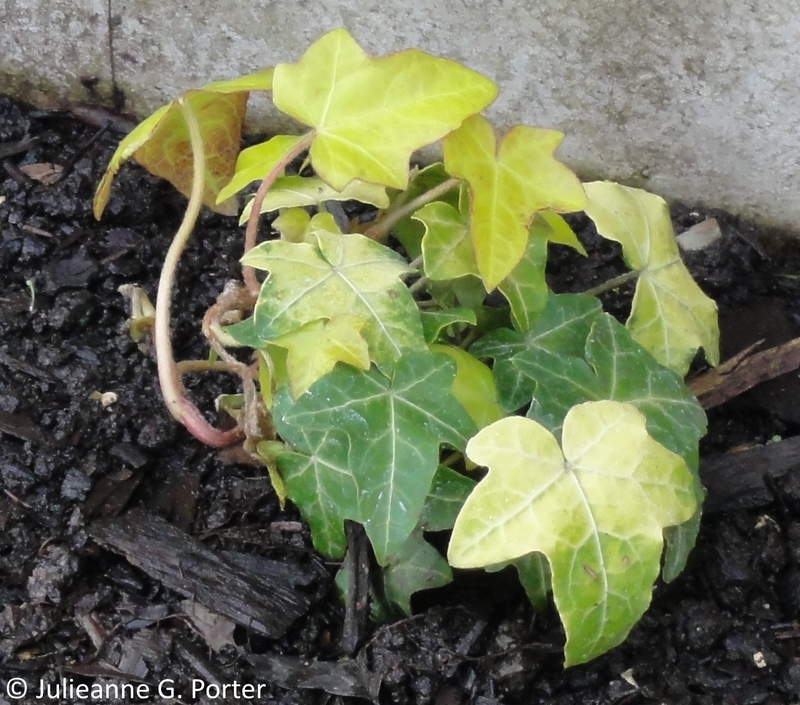 End of month view is hosted by Helen Johnstone, aka @patientgardener. 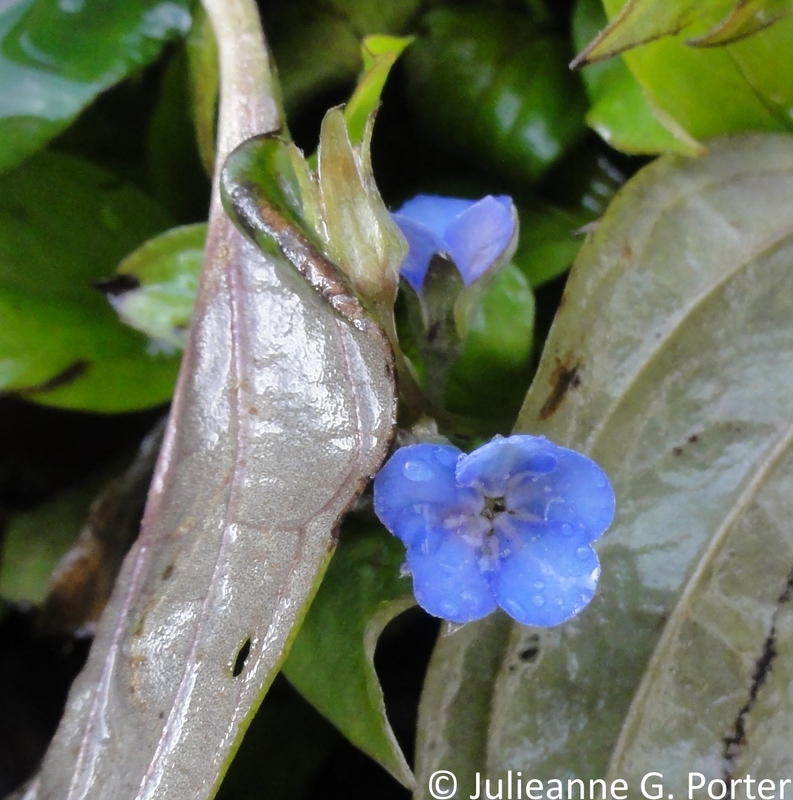 Visit Helen's blog for her March 2015 EOMV and links to other bloggers EOMV posts. 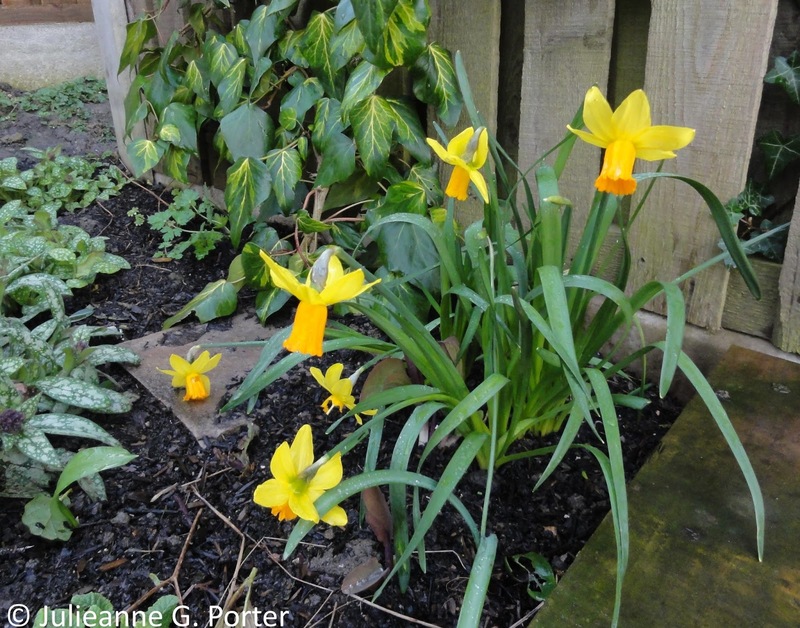 Our gardens are at a very similar stage right now Julieanne. We have very similar taste in plants and it's really nice to seeing many of the plants I grow growing in your garden too and how they perform. I have N. Jetfire in quite a bit of shade to and it's entirely happy there, SNAP! 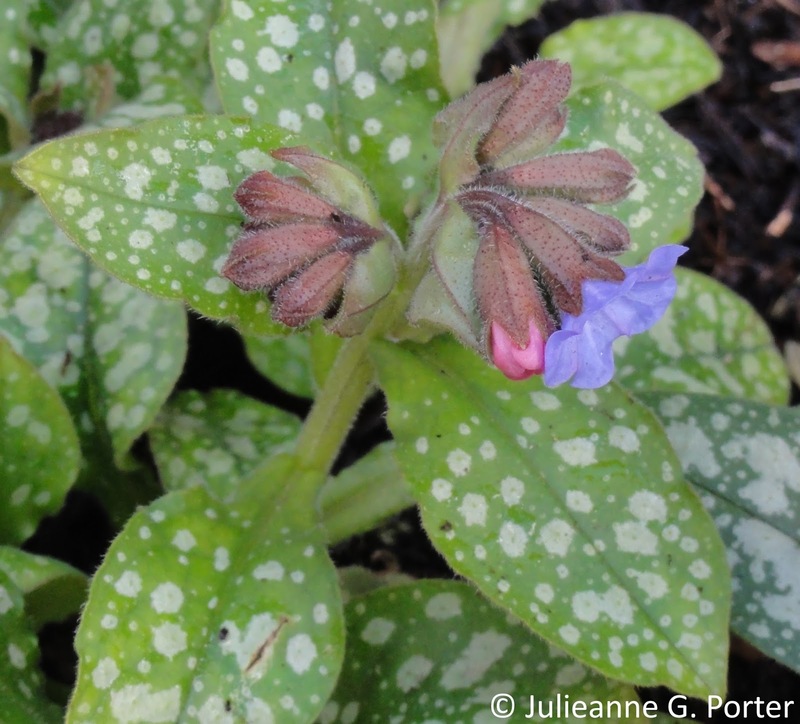 You have some lovely spring flowers, I do love a good pulmonaria. Lots of lovely things to admire and more to look forward to. 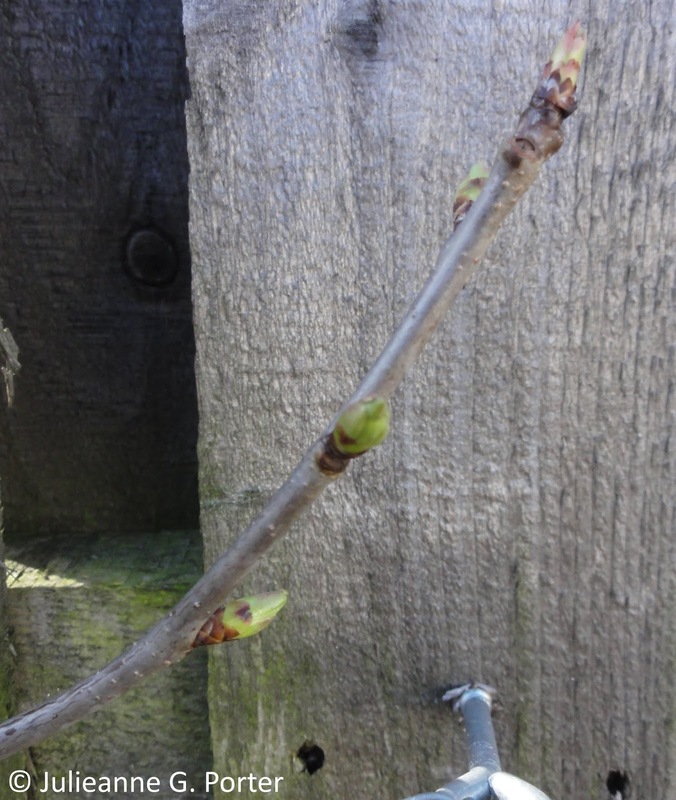 Your acres are ahead of mine, which still has tightly furled buds. I adore Primula 'Guinevere', what a dainty beauty. The woodrush is on my list for my problem front corner, but I remember of old how rampant it can become. I love the Spring blues too, a nice contrast to all the yellow. Hacquetia Is a little gem. I need to rescue mine, it's struggling to hold its own against some rampant neighbours. Wowwy - you certainly have a lot of plants, and so many getting ready to put on a fabulous show in the coming weeks. 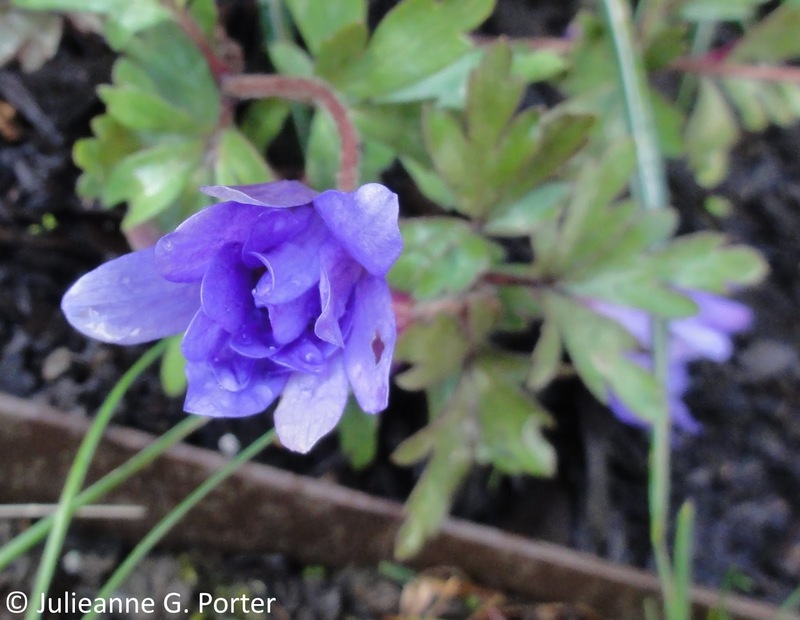 I'm a big fan of your bright blues with the anemones and Pulmonaria. 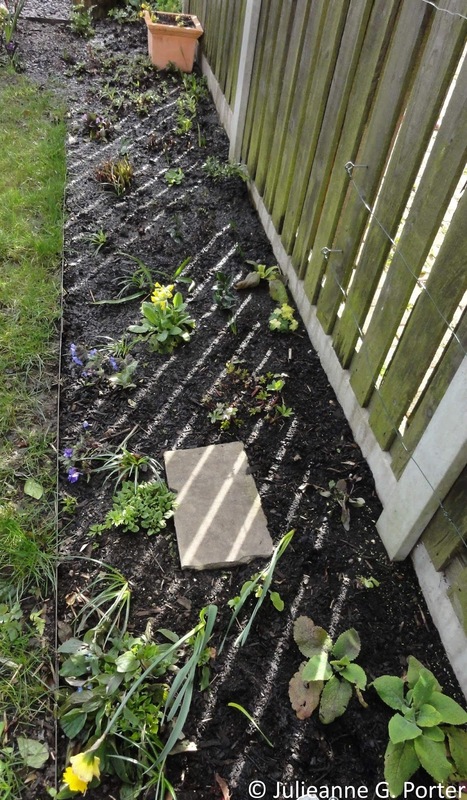 Your spring garden is looking lovely and is filling in nicely Julieanne. I have a few Bergenia too and they stay evergreen in my garden. I must admit that without the flowers they just look like red cabbages and I am not that fond of them.